McCain will meet with Jindal later this week. (CNN) - John McCain is set to meet with Louisiana Gov. Bobby Jindal Wednesday, a move that is certain to increase speculation the Arizona senator is seriously considering the 37-year-old Republican for his running mate. News of the meeting, first reported by the Washington Post, comes amid reports the McCain campaign has mulled the possibility of naming the vice presidential candidate later this week in an effort to steal the media spotlight from Barack Obama's trip overseas. Sources close to the Republican presidential candidate have indicated that scenario is one of several possibilities that have been recently discussed. Speculation first swirled around Jindal earlier this summer when he was one of a handful of politicians McCain invited to his Sedona, Arizona ranch. The long weekend was described as purely social, though former Massachusetts Gov. Mitt Romney and Florida Gov. Charlie Crist were also in attendance. Jindal is considered a boy wonder of sorts within the Republican Party, and has been lauded by several conservatives wary of John McCain - including talk-radio host Rush Limbaugh. But the decision would undercut one of the Arizona senator's chief arguments against Obama: his relative lack of experience. The Louisiana governor is nearly 10 years younger than the Democratic presidential candidate. iReport: Who should be VP? Weigh in! 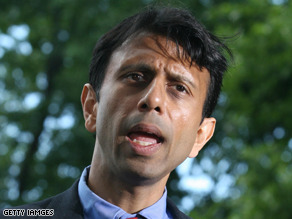 Jindal has remained mum on whether he is interested in or being formally vetted for the vice presidency. Meanwhile, McCain specifically avoided answering any questions about his VP timetable Tuesday morning. A cowboy and an Indian. Bobby's too smart to fall for that. Do you people really believe that the Republican Party would actually sellect a non-white man for the VP spot? ?